Bacari PDR, a sibling of downtown wine bar Bacaro L.A., will open in Playa Del Rey in early September 2014. Chef Lior Hillel, an alum of Jean-Georges in New York, will offer a menu of “cicchetti” Italian small plates such as lamb stuffed eggplant; oven-roasted bone marrow with caper panko and sea salt; and glazed pork belly skewers. The wine list will focus on lesser-known varietals from all over the world, and there will also be craft beers and cocktails. Bacari PDR, 6805 Vista Del Mar Ln., Playa Del Rey, CA 90293, no phone. Loteria Grill has opened at The Original Farmers Market at Los Angeles International Airport’s Delta Terminal 5. Travelers can expect regional Mexican cuisine including Acapulco-style ceviche, red pozole pork and hominy chile, and chicken in mole poblano, as well as specialty margaritas from a full-service bar. Breakfast, Lunch & Dinner daily. Loteria Grill LAX, Los Angeles International Airport, 550 World Way, Los Angeles, CA 90045, no phone. Mario Batali and Joe Bastianich’s successful New York City Italian market and food court, Eataly, will be opening an L.A. location at the Westfield Century City mall in 2017. Eataly, Westfield Century City, 10250 Santa Monica Blvd., Los Angeles, CA 90067, no phone. Contemporary Korean restaurant Gaji has soft opened for lunch in downtown, with chef Minh Phan (Beachwood Café) at the helm. Gaji means "tree branch" in Korean. The modern space features subdued hues; a patio will open later this summer. Expect “Asian soul food” dishes like kimchi-stuffed dates, duck rillettes with a ginger-satsuma marmalade, ravioli filled with beef cheeks in pho broth, and a whole allium-stuffed loup de mer. 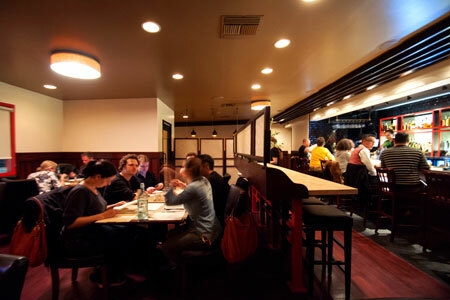 Gaji, 523 W. 7th St., Los Angeles, CA 90014, 213-243-0780. Adam Cole (ink.) and The Bazaar by José Andrés’ chef de cuisine Holly Jivan, his wife, will open Maple Block Meat Company in Culver City. It’s expected to launch towards the end of the year, and the menu will spotlight Texas barbecue. Maple Block Meat Company, 3973 Sepulveda Blvd., Culver City, CA 90230, no phone. Hotel MdR has debuted its new Italian eatery, Barbianca Local Kitchen. Expect a daily bruschetta board, roasted polenta cakes, house-made pizzas with the likes of prosciutto and béchamel, shrimp garganelli and Pinot Noir-braised short ribs. Happy hour features specials on wine, beer and cocktails, and 50 percent off appetizers. Breakfast, Lunch & Dinner daily. Barbianca, Hotel MdR, 13480 Maxella Ave., Marina del Rey, CA 90292, 310-577-6039. West Third Street’s latest chic eatery is ToC, a French-style bistro and pâtisserie with an outdoor patio from Food Network contestant Penny Davidi (executive chef, PUMP Lounge). At this, Davidi’s first restaurant, pastry chef Stephane Treand creates elegant Viennoiseries and pastries. The menu features omelets, tartines, sweet and savory crêpes, escargots, salade Niçoise and quiche Lorraine. Catering and pastry classes will be coming soon. Breakfast & Lunch daily. ToC, 8556 W. 3rd St., Los Angeles, CA 90048, 310-275-4235. Restaurateurs Steven Arroyo (Escuela Taqueria) and Bruce Marder (Capo) have opened a French bistro, Marvin, on Beverly Boulevard, in the former House Café. Expect fresh oysters, fine cheeses and charcuterie, steak tartare, cassoulet, steak frites and chocolate soufflé. Dinner Tues.-Sun. Marvin, 8114 Beverly Blvd., Los Angeles, CA 90048, 323-655-5553. The San Francisco/Bay Area café chain La Boulange has brought a location to Los Angeles. The menu offers breakfast items (served all day), soups, salads, sandwiches and build-your-own burgers. La Boulange, 359 S. La Brea Ave., Los Angeles, CA 90036, 323-525-0164. Mastro's Ocean Club in Malibu has opened in the the former Chart House location. Seafood takes a starring role but the menu also features steaks, à la carte sides (creamed spinach, lobster mashed potatoes) and desserts including Mastro's signature warm butter cake. Mastro's Ocean Club, 18412 Pacific Coast Hwy., Malibu, CA 90265, 310-454-4357. Chef Ben Ford will open an outpost of Ford’s Filling Station at JW Marriott Los Angeles L.A. Live. The restaurant, which is scheduled to open in fall 2014, will take over the space of LA Market and serve breakfast, lunch and dinner daily. This will be a second location of Ford's Filling Station, joining a branch at Los Angeles International Airport (the original Culver City gastropub has closed). Ford's Filling Station, 900 W. Olympic Blvd., Los Angeles, CA 90015, 213-765-8600. The Acme Bar Group (Library Bar, Laurel Tavern) has unveiled the new Beelman’s Pub in the Historic Core at 6th and Spring Streets in Downtown L.A. A dramatic garden sports ivy, moss, brick walls and cobblestone patio steps lit by European wall sconces and candlelight. 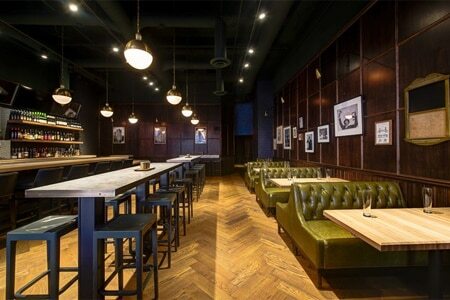 Inside, there are large communal tables, classic leather Pullman booths and walls of dark wood veneer. Expect a high-end, European-inspired cocktail list featuring Spanish sherry, Italian bitters and French bubbles, and a food menu with elevated pub fare and charcuterie. Beelman’s Pub, 600 S. Spring St., Los Angeles, CA 90014, 213-622-1022. To celebrate Toscana’s Silver Anniversary in 2014, the Brentwood restaurant will present a “Toscana Classics” menu, showcasing some of its most popular dishes, from June 15 to August 15. Featured favorites will include insalata carciofi, Toscana’s original pollo al mattone, ravioli radicchio and others at their original 1989 prices. Pricing will be à la carte, available Sundays through Thursdays. Toscana, 11633 San Vicente Blvd., Los Angeles, CA 90049, 310-820-2448. Chef Ben Ford's Culver City gastropub Ford's Filling Station has closed. The location at Los Angeles International Airport, (Delta, Terminal 5), remains open, and a downtown outpost of Ford’s Filling Station is scheduled to open at JW Marriott Los Angeles L.A. Live in fall 2014. Ford's Filling Station, 9531 Culver Blvd., Culver City, CA 90232, no phone. Allumette in Echo Park has closed. Owners Charles Kelly and Bill DiDonna will likely open a new concept in the space, and wunderkind chef Miles Thompson has future projects in the works. Allumette, 1320 Echo Park Ave., Los Angeles, CA 90026, no phone. Popular Beverly Hills haunt Kate Mantilini closed June 14, 2014, after 27 years, due to a lease dispute. The location of Kate Mantilini in Woodland Hills remains open. Kate Mantilini, 9101 Wilshire Blvd., Beverly Hills, CA 90210, no phone. In Brentwood, the elegant Italian eatery Villetta has closed. It’s rumored that the folks behind AGO will reopen it with a new Italian concept. Villetta, 246 26th St., Santa Monica, CA 90402, no phone. Near Studio City, Spoonful has closed and will be replaced by a third location of Mercado. Spoonful, 3413 Cahuenga Blvd. W., Los Angeles, CA 90068, no phone.